Conveniently located at the southern gateway to Napa & Sonoma wine country, Cornerstone Sonoma is an eclectic collection of shops, wineries and a gourmet cafe set amidst nine acres of garden installations created by the world's leading landscape architects. Come early to take it all in before the wedding. 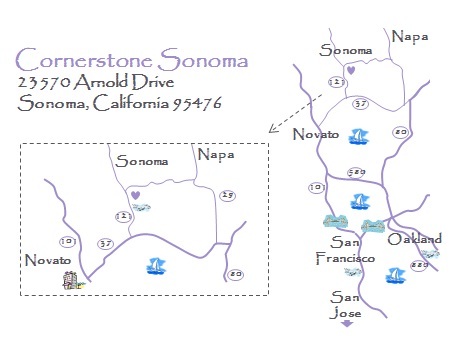 Cornerstone Sonoma opens every day at 10am and there is no admission fee. Take US-101 N. In 23 miles merge onto CA-37 E toward NAPA/VALLEJO. Travel 7.7 miles and turn left onto CA-121 N toward SONOMA/NAPA. Cornerstone Sonoma is on your right 6 miles marked by the white picket fence. Take 80 East toward Sacramento to CA-37 West. Turn right at Carneros Highway 121 toward Napa/Sonoma. Go 6 miles north and Cornerstone Sonoma will be on your right, marked by the white picket fence.